Fully automatic loading and unloading of components in the T-86 permits unmanned operation, with PLC-controlled blast and airwash cycles. 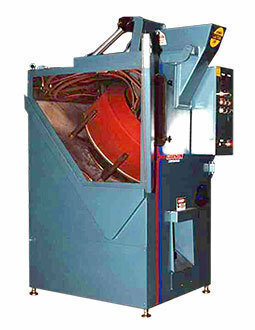 The T-86 tumble-blast machine has a 44" x 60" machine footprint. Up to 4 suction-blast guns or 2 pressure-blast nozzles are bracketed in position over the mouth of the perforated steel tumble-basket to cover the batch of components as they turn over and over. The rotation speed of the basket is adjustable, so you can optimize the tumbling action for the most efficient process cycle. At the end of the timed blast cycle, an automatic airwash blow-off cycle removes media and dust from the parts as they continue to tumble. Then the finished parts are discharged through the automatic chute at the bottom-front of the cabinet, and the upper in-feed hopper loads the next batch. Dead time between cycles is minimized in nearly continuous operation – in fact, the T-86 can out-produce tumble-blast machinery of much larger cubic capacity and dramatically reduce your manpower requirements. Looking to Purchase a New GUYSON T-86? Looking for a USED T-86?Have one to sell?